Get ready to sparkle in our unique, handmade star rings! 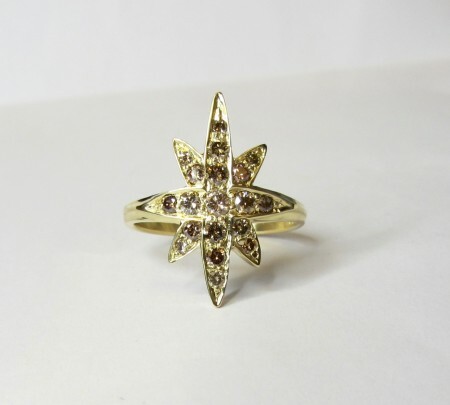 First Evening Star ring in 18ct yellow gold and approximately 0.55 carats of cognac and champagne coloured diamonds. 22mm by 18mm. Dazzle in the new collection of star rings, inspired by the cosmos! Each unique ring is individually carved by hand before being handcrafted into these magnificent constellations using only the finest materials – 18ct white and yellow gold along with carefully selected coloured diamonds in shades of champagne and cognac. The subtle use of colour and the overall style is reminiscent of antique jewellery whilst remaining very modern. Each and every ring is one of a kind, bespoke versions can be made to order to your specifications.